Barnes & Noble/Bookstar Studio City, CA signing – Sat. July 15 at 1pm! Barnes & Noble Glendora, CA signing – Sat. May 20 at 2pm! Barnes & Noble Burbank Signing – April 8, 2017 at 2pm! Free EMPIRE OF THE WOLF #1 for May 7th Free Comic Book Day! In celebration of 2016’s Free Comic Book Day on May 7th, pick up Issue #1 of Empire of the Wolf on comiXology for FREE! From 11.30-1pm on Sunday 7/13/15 at Artist Alley table BB-03, artist Dan Parsons and writer Michael Kogge will sign Empire of the Wolf ! Come on by! From 1-3pm on Saturday 7/12/15 at Artist Alley table BB-03, artist Dan Parsons and writer Michael Kogge will sign Empire of the Wolf ! Dan might even add his signature wolf — carpe lupum! Copies of Empire of the Wolf will be available at Mysterious Galaxy, booth #119, and at artist Dan Parsons’s table in Artist Alley, BB-03! Dan and writer Michael Kogge will be on hand to sign it! 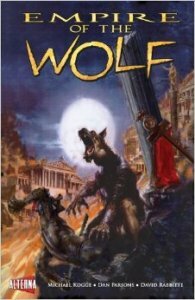 The great Frank Mula of the comic news site Comic Crusaders interviewed writer Michael Kogge recently about Empire of the Wolf. Check out the interview here! They also posted a preview of the book, featuring 5 pages. Does a werewolf rule Stonehenge? From the first page of Empire of the Wolf!